Thailand is full of ghosts and other spirits. No self-respecting Thai would be caught dead (no pun intended) without some charm or amulet on his person to protect him or to bring him luck. Many men will wear an amulet around their necks, just as Christians will wear crosses or medals of saints. 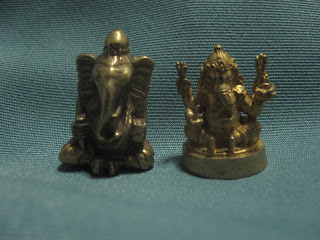 Women may also wear amulets or they might carry a charm or medal in their purses and almost every car in Thailand will carry its own little shrine on the dashboard honoring Buddha or a Hindu deity, or perhaps a favorite monk. The sale of amulets in Thailand is a big business. Most wats (Buddhist monastic complexes) sell them and they are ubiquitous in all the night markets. Bangkok has an entire section know as the Amulet Market, at which scores of sellers display table after table of amulets, charms, and medallions. I visited the market and was overwhelmed by the sheer number of items offered for sale, literally a million or more. People are serious about their amulets. It is not uncommon, as I noticed at the Amulet Market, for a savvy buyer to use a jeweler’s loupe to closely examine the item for age and authenticity. Some amulets are antiques and prized by collectors, others are designed to be worn. They come in all shapes and sizes, depicting a wide range of spirits, gods, and holy men. They may be made of metal, ceramic, terra cotta, wood, sometimes even plastic. 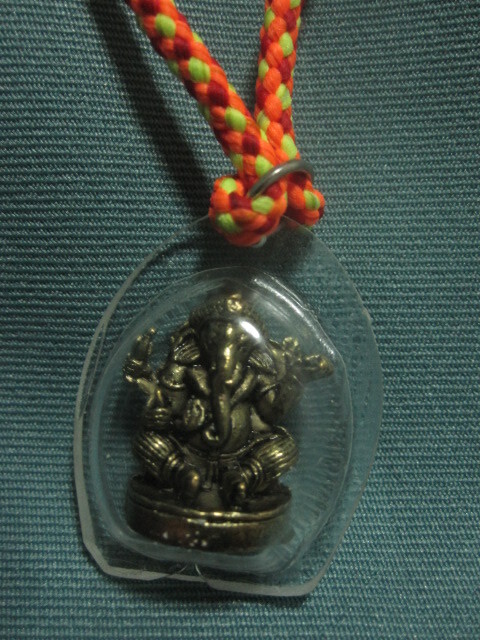 A monk gave me this Ganesh amulet. Any good bookstore will carry one or more of the several magazines devoted entirely to amulets. New amulets are often advertised on billboards, often with a larger than life picture of the designer, usually a monk. Some monks have achieved celebrity status through their art and their amulets are highly prized. Amulets are frequently worn for protection against accidents, sickness, bad luck, and, of course, evil spirits and ghosts. So, when I said I wanted an amulet that would attract ghosts, I certainly got strange looks. But I’m a ghosthunter; wouldn’t such an amulet make sense? I asked my friend Pom at Silpakorn University in Nahkon Pathom to write me something in Thai that I could show to an amulet seller. Pom wrote, “Would like to have something that can give me access to contact/see/talk to spirits/ghosts—I don’t want to use this as an evil thing or to hurt anybody.” Alright then, I was good to go. I found my amulet dealer at the Nahkon Pathom night market outside the Phra Pathom chedi, the tallest Buddha memorial in the world. The dealer had two stalls side by side at the market, one to sell amulets, the other to sell “flying ice cream” (nothing like diversifying in business). Mr. Flying Ice Cream guy wowed the crowds by scooping out ice cream then flinging it high into the air and catching it in the scoop behind his back. Another Thai that spoke English said that Mr. Flying Ice Cream claimed he had performed in Hanoi, Beijing, and Las Vegas; I had my doubts, even in Vegas. Mr. Flying Ice Cream read Pom’s note and knew immediately which amulet I should buy. 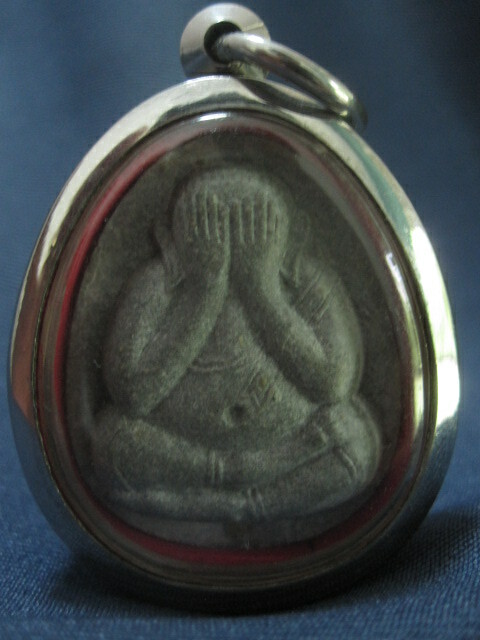 He showed me one that depicted a monk with his hands covering his face. He kept smiling, pointing at the amulet while giving me a thumbs-up sign and repeating, “Number one!” On a piece of paper he wrote down the price—5,000 Baht, about $150. I wrote down 1,000 Baht, about $30. We settled at 1,500 Baht, about $45, which meant that the amulet was probably worth about $5. The sacrifices I make for research! The amulet (below) is called Phra Phid Ta, which roughly translates to “monk closed eyes.” It depicts a monk who, according to legend, closely resembled the Buddha and was often mistaken for him. His sense of humility and respect for the Buddha caused him to cover his face with his hands so that no one would ever take him to be the Buddha again. The amulet is supposed to protect the wearer from harm—especially from knives and guns—and is also supposed to render the wearer nearly invisible to his opponent. I wondered if someone “nearly invisible” would look like a wispy ghost. Perhaps that was how one attracted a ghost, by looking like one. I didn’t know for sure, but I would soon find out.